Crash Bandicoot Buttobi 3-dan Mori! Crash Bandicoot Buttobi 3-dan Mori! 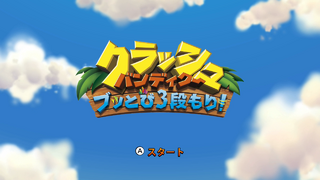 (クラッシュ・バンディクー ブッとび3段もり！), known as Crash Bandicoot: N. Sane Trilogy in the West, is a compilation featuring enhanced versions of three PlayStation games; Crash Bandicoot (クラッシュ・バンディクー), Crash Bandicoot 2: Cortex no Gyakushuu! (クラッシュ・バンディクー2 コルテックスの逆襲!) (Cortex Strikes Back) and Crash Bandicoot 3 Buttobi! Sekai Isshuu (クラッシュ・バンディクー3 ブッとび!世界一周) (Warped). Sega published the Nintendo Switch version in Japan. The PlayStation 4 version was originally handled by Activision, as were the Western versions. Main article: Crash Bandicoot Buttobi 3-dan Mori!/Magazine articles.